C1126. ARTUR RODZINSKI Cond. NYPO. : Piano Quartet #1 in g, Op.25 (Brahms-Schonberg), Live Performance, 24 Dec., 1938; Musique de table - Orchestral Suite (Manuel Rosenthal), Live Performance, 13 Oct., 1946. (Canada) St Laurent Studio YSL 78-148, (from Rodzinski collection). Transfers by Yves St Laurent. "A pupil of Ravel at the Paris Conservatoire, Manuel Rosenthal established a position in French music as one of the most distinguished conductors of his time and as a composer. His compositions embrace a number of genres and are couched in generally neoclassical terms and forms. 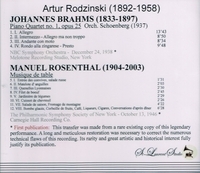 Rosenthal's varied orchestral works include MUSIQUE DE TABLE, unlike Telemann's, which actually depicts a dinner party, starting with the arrival of the guests and ending in coffee, liqueurs and cigars. Ernest Ansermet was to say of this 1941 suite 'I did not know it was possible to orchestrate better than Ravel'."